The tiny house movement is real and growing with more and more people jumping on board. As a result, kitchens around the globe are getting smaller and smaller, but they still must remain as functional as always. As a result of the need to fit a whole lot of kitchen into very small spaces nifty new ideas for small kitchens are being born every day. No matter the size of your kitchen you don’t have to sacrifice convenience if you plan right and set yourself up with the right tools. Here are 9 of the latest trends for remodeling small kitchens. A huge issue small kitchens often face is lacking enough countertop space. In order to add more prep area to your kitchen you can install a foldaway center island. It doesn’t have to be anything too fancy. Simply attach a wood slab that easily folds down when you need to use it and folds back up against the wall to save space when not in use. We all know that painting your kitchen white will make it look bigger, but there are other ways to give off the appeal of more space. Incorporating glass windows, reflective mirrors or glass cabinets will help open up your kitchen space. Adding a window brings the outdoors in, naturally expanding the feel of a space. Installing windows isn’t cheap but hanging up a mirror is affordable on any budget and has a similar effect. Adding glass to select cabinet doors can also make your small kitchen feel less petite, as well as incorporate a nice decorative appeal. Lighting fixtures will really add to your kitchen if properly installed. Bulky lighting fixtures may look nice but they take up precious square footage and can look overly large in a small space. You don’t have to stick with lighting that comes from the ceiling. Instead, you can work your way from the ground up when it comes to the latest lighting technologies. Lighting can be attached beneath cabinets on the toe kick, backsplashs or on the underside of higher cabinets. In a small kitchen the flooring is one of the first places the eyes naturally gravitate towards. You want to make sure your floors pop with a fresh, nice and clean appearance. Since you have less square footage to fill you might be able to afford materials that are higher end for a fraction of the usual cost. Nice wood or marble floors will look incredible. There are less expensive options that look great in small kitchens as well, such as glossy black and white square tile floors. Just as quickly as the eye moves towards the floor it bounces back to the countertops. 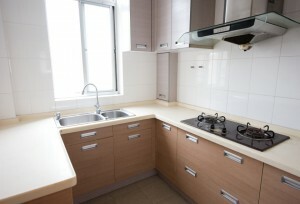 In a small kitchen the countertops are everywhere you look and they need to look nice. Adding pretty marble or granite countertops will make your kitchen pop. People often avoid adding color in small spaces because they fear they will make the space look smaller. On the contrary, pops of color throughout your décor, granite, backsplash, cabinetry or accessories can make your kitchen seem less small and more on-point in regards to style. When dealing with a tiny kitchen you might not want a traditional bulky refrigerator. You can get a fridge that sits low to the ground and stretches horizontally as opposed to vertically. This gives you the option of adding countertops above the fridge for extra space. The only downside is that you will have to crouch down to open the doors and access refrigerator contents. Depending on how small your kitchen is this may or may not be a useful idea. In a small kitchen you have to make use of every last inch of space you are given to avoid clutter and overcrowding. When designing your cabinets don’t just think of them as random boxes that will contain ‘whatever.’ Instead, plan out what you will use all of your cabinets for and then create them accordingly. One cabinet can offer a world of additional space if it includes the proper amount of shelving for dishes, hooks for mugs and magnetic strips to hold spices on the inside door panel. If you think of these things beforehand your kitchen will operate with more efficiency while feeling larger than it really is. Most kitchen cabinets do not extend up to the ceiling but instead stop short, leaving free space between the top of the cabinet and the ceiling. Why waste any little bit of space you have to work with? Installing cabinets that reach all the way up to the ceiling is a great idea gaining more popularity. While the top cabinets may be too high to reach on a regular basis you can store your less used kitchen gadgets up here. Invest in a quality stepping stool and you’re good to go! If you like decorating the tops of your cabinets add glass doors to the cabinets that touch the ceiling and you won’t lose this decorative appeal but you’ll gain more storage space. At Tops Kitchen Cabinet we offer wholesale kitchen countertops, cabinets, accessories and more. Make your small kitchen remodel look high-end on any budget by contacting us today!